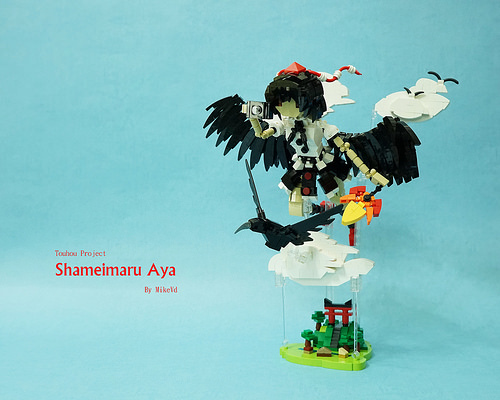 Mike Dung has brought Aya Shameimaru from the Touhou Project to life in LEGO. Aya Shameimaru is a character who appears as a reporter in many of the games within the Touhou Project series. Aya covers the news in the fictional realm of Gensokyo and also belongs to the Crow Tengu species, giving her a height advantage when taking photographs. Mike manages to convey character details and also the fantastical nature of the game within his build. I have to admit that I really like all the crows, Aya’s wings, the crow seen flying just below Aya, and the clever use of the black hotdog part to show a crow flying in the background. Forced perspective is utilised particularly well in the microscale Shinto shrine that appears to lie far below Aya as she enjoys her birds-eye view of the world. The overall feeling is one of movement, distance and height, something that is not easy to achieve within a small build.